The past 12 months have undeniably seen a surge in popularity of the liquid lipstick, and to no surprise; they offer a lot more durability and opacity than the traditional lipstick. It occurred to me recently when I was reorganising my make-up stash just how big of a chunk Stila's Stay All Day Liquid Lipsticks take up of my current liquid lipstick collection. I thought: seeing as I evidently love them so much and I have plenty of them, why not do a post on them? 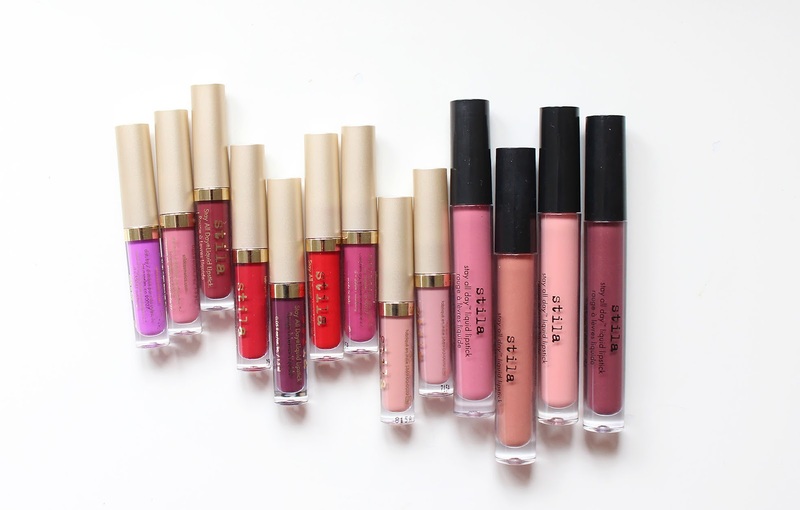 I first started taking interest in Stila's liquid lipsticks when Anastasia Beverly Hills launched theirs - which became endlessly raved about - but were difficult to get hold of in the UK. So, when I saw a Stila counter displaying liquid lipsticks in my local Boots, I decided to see what this kind of product had to offer. It sort of goes without saying that I haven't looked back, doesn't it? I love Stila as a brand and my favourite product of theirs definitely has to be these. At £16 I don't think they're bad value at all either, especially when you compare it to others on the market, such as MAC's Retro Matte being £21. The formula is great! The drying factor is an unavoidable price you're just going to have to pay when it comes to liquid lipsticks, but these ones aren't overly drying at all. They have a very creamy and soft feel to them when they're first applied, so they don't dry uncomfortably. Plus, I love, love, love the shades! 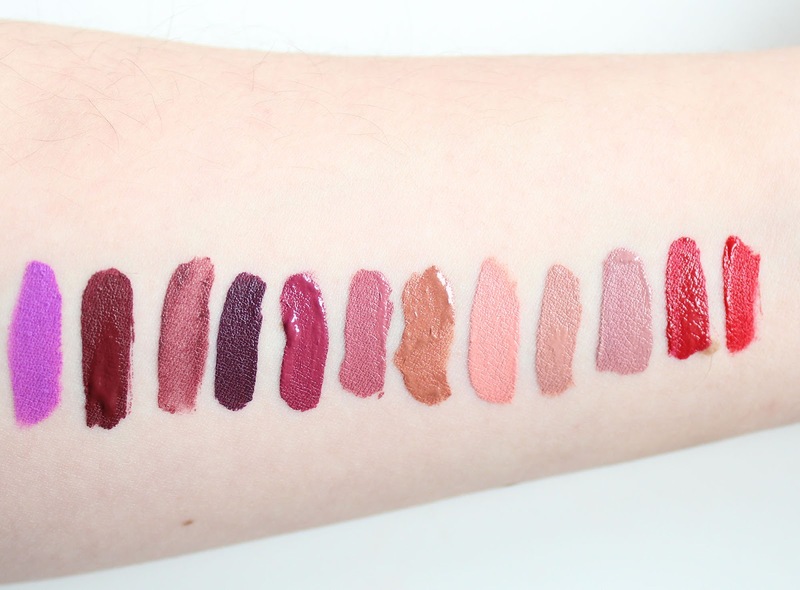 In the image below, I swatched the product with just one swipe of the application wand, and as you can see they're very opaque. The colour range is very to my taste (...ok, maybe except the bright purple one), with the majority being very wearable and feminine. I found the two dark purple shades flaked off when I'd had a drink, although this wasn't an issue with any of the lighter colours. I would suggest that the flaking was only obvious because the colour of the product was so dark and different to my natural lip colour. With exception to those two, I have found them to be very long lasting, even against food and drink. If you're a liquid lipstick lover and have yet to add Stila to your collection, I would strongly recommend doing so because the colours are just beautiful and the product is a very high quality. Up until Stila recently launched their Spring 2016 range, two of my personal favourite shades, Caramello and Baci, were only available in miniature versions in a gift set. Now they're available in the regular size individually, so they might be worth picking up. I'll definitely be purchasing when my mini's have run out! I suffer from dry lips too :-( whenever I'm not wearing a lipstick I'm constantly applying lip balm haha that seems to keep it from being out of control! Hope your comments challenge is going well! These look so beautiful, Anna from Vivianna Does Makeup is always raving about these!